Since the beginning of the Catalonia bid for independence, the Spanish Government has made an effort to prevent it from happening. However, over the past few days the state has intensified its efforts, mounting to an unprecedented repression. Earlier this week [week starting on 18 September 2017], the Spanish police force arrested 15 Catalan Government officials. Spanish Prime Minister Mariano Rajoy argued that the state was forced to act since the Constitutional court declared the vote illegal. But the Spanish Government did not stop there. The Spanish Civil Guard searched a number of newspaper offices without warrants and large amounts of referendum material was seized. When appearing before the press, Mariano Rajoy justified the raids and arrests by arguing in defense of the Constitution and the “rights of all Spaniards” and warned that “greater harm” lies ahead if the 1 October vote continues as planned. Spain’s top court Judges have used orders that violate rights by loosely interpreting the Supreme Court’s ruling on the referendum’s illegality. They have also warned that those who participate in the poll could face prosecution, including 700 Catalan mayors. Additionally, the Constitutional court declared that it will fine members of an electoral board overseeing Catalonia’s referendum anywhere between 6,000 to 12,000 euros a day. Nevertheless, the Catalan Government has announced that it will go ahead with the vote on 1 October and that it will be binding. This conflict is now becoming an issue of an attack on basic rights, including freedom of assembly, speech and the press, and less about different concepts of democracy. Spain’s King Felipe has called for political dialogue and for the Spanish Government to listen to the voice of the people. 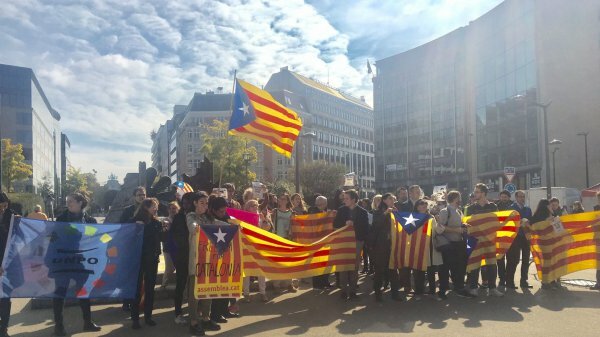 On 20 September 2017, UNPO joined Catalan supporters at the Schuman square in Brussels to protest the violations of the Spanish Government and raise our voice in defending Catalonia’s self-determination. In Barcelona, thousands of people gathered to protest outside of Catalonia’s judiciary body to demand the release of the officials arrested in connection with the planned referendum. On this occasion, UNPO strongly condemns the Spanish Government’s actions in violating the basic freedoms and values. UNPO also welcomes the Catalan Government’s right to a referendum on independence planned for 1 October 2017 and their self-determination. Self-determination is enshrined in international treaties, including the United Nations Charter, the International Covenant on Civil and Political Rights(ICCPR), and the International Covenant on Economic, Social and Cultural Rights ICESCR. Self-determination is the legal right of a people to decide their own destiny, its form of political organization and their relation to other groups. The events that took place this week exemplify the difficulty of obtaining self-determination. The Catalans and several UNPO members share this difficulty and continue their efforts in determining their own destiny. The Scottish referendum represents a positive example of self-determination, where the people of Scotland voted freely and without government repression. The Scottish experience, which resulted in a slight majority of “No” votes in 2014, is a good example of how an expression of self-determination is not necessarily tied to the decision to go for full independence, but by the actual right to decide. Read here a reaction from the President of the Movement for the Self-determination of Kabylia (MAK)-Anavad to the current situation in Catalonia (in French).